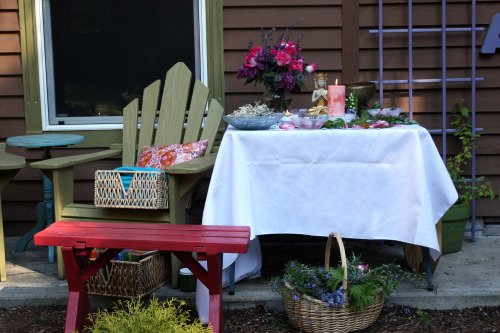 The beautiful shrine set up outside Jen’s studio. The food inside the house. This past Saturday, I was off to another yoga retreat on Bainbridge Island with my friend Jen. There are many reasons I treasure these day-long retreats. One is getting to spend some time with one of my oldest and dearest friends. Another is that I get to participate in two challenging and invigorating yoga classes. Another is sharing in this incredible community of women. 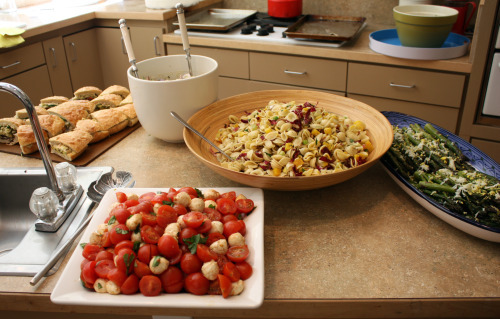 And I love getting the chance to cook for those deeply appreciative and very hungry yoginis. In general, lunch is funny for me. I usually either eat it out, or scarf down something I would be embarrassed to tell you about before running off to pick up my kids. I almost never actually prepare something for myself, so it is always a fun challenge to come up with lunch menus for these retreats. I want to make something hearty yet not heavy and I want there to be plenty of variety. Even though I almost never eat sandwiches myself (I find them either too spare or too greasy), I try to come up with a new one for each retreat. Hungry women need sandwiches. I’ve been on a bit of a creative roll here at Dana Treat. After feeling tied to my cookbooks for most of my cooking life, I have been branching out and trusting myself more. This time I had the idea to take the idea of a pan bagnat and run with it. A pan bagnat is made using a large round of bread which is cut in half, innards scooped out, then stuffed with all manner of things, but traditionally including olives, hard-boiled eggs, and tuna. The sandwich is made the day before you plan to serve it, wrapped tightly, and stored in the refrigerator so the flavors have a chance to meld and some yummy juices seep into the bread. I wanted to use the idea, but change up the inside. To feed 25 people, I knew I would need at least four of these rounds, so I decided to do two each of two different sandwiches. I immediately had an idea for the first one, an Antipasto Sandwich. I drizzled whole portabello mushroom caps and thick slices of zucchini with olive oil, sprinkled them with salt and pepper, and roasted them in a 425°F oven until they were nice and soft and a little browned. I allowed them to cool and then thinly sliced them. To save time, I used jarred roasted red peppers, and store-bought tapenade and hummus (don’t tell anyone!). I layered it as follows: tapenade spread on the bottom of the bread, roasted red peppers, portabello slices, provolone cheese, zucchini slices, chopped marinated artichoke hearts, more cheese, arugula leaves, and hummus spread on the top of the bread. This sandwich came together easily in my mind and it worked beautifully in practice. It also held together well under the serrated knife although the bottom of the bread got a little soggy from the tapenade. No one complained. The second creation I mulled over for longer. I had seen a recipe for a sandwich with jack cheese, avocado slices, and a tomatillo/sour cream spread. Good, but not quite hearty enough for this kind of bread or this kind of eater. I decided to make a type of corn salsa with scallions and roasted tomatillos, poblano peppers, and cilantro. I kept the avocado and the jack cheese and moistened the bread with a remoulade sauce made famous by none other than Jen herself. She serves it with fish tacos and I knew the flavor would work here. Finally, because I had some and felt like I needed one more layer, I tossed some thinly sliced cabbage with more of the remoulade to make an instant coleslaw and piled that on top. That sandwich was a little trickier to cut – the filling kept wanting to ooze out the sides – but the flavors were fantastic. Really unusual for a sandwich and I like unusual. I’m dubbing that one Corn Salad Sandwich with Tomatillos, Poblano Peppers, and Jack Cheese. Everyone loved the sandwiches which I think is a great success seeing as I had never made them before and was guessing and hoping it would all come together. Oh, you thought “Dynamic Duo” referred to my sandwiches? No, I meant me and Jen. 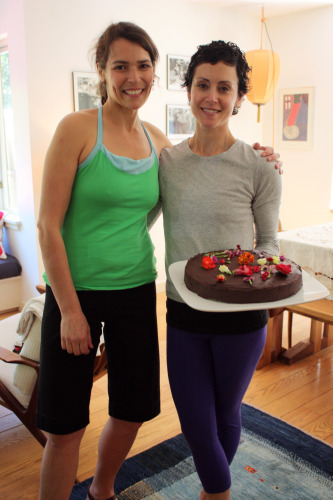 Yes, that is a birthday cake – her 40th is next week. Recipe coming soon. For now, my “unusual” sandwich. This looks like a long recipe but parts of it can be done in advance and I swear it will take you longer to gather the ingredients for the remoulade than it will to mix it together. Don’t forget, the whole sandwhich needs to spent the night in the refrigerator for maximum flavor, so plan ahead. When all is said and done, you may have leftover corn salsa. I don’t need to tell you the many ways that you could use that delicious stuff, but Randy topped grilled salmon with it and loved it. Preheat oven to 400°F. Place the poblano chili and tomatillos together on one rimmed baking sheet. Do not oil them, just place them in the oven. Roast for about 15 minutes total, until the skin of the poblano is turning black and the tomatillos are turning brown and starting to leak their juices. You will need to turn the poblano periodically so it roasts on all sides. Give the tomatillos a little shake while you are at it. Using a serrated knife, cut the bread round in half. Using your fingers, pull most of the innards out of both the top and bottom of the bread and set aside. (You can make fresh bread crumbs with this part by allowing them to dry out overnight and then pulsing in your food processor. Store them in your freezer in storage bags.) Take about half of the remoulade and spread it over the bottom of the bread round. Sprinkle with 1 cup of the cheese. Spoon a generous amount of the corn salsa over top of the cheese. Lay avocado slices over the salsa, then sprinkle with the remaining ½ cup of cheese. Put the cabbage in the bowl with the remaining remoulade and mix well. 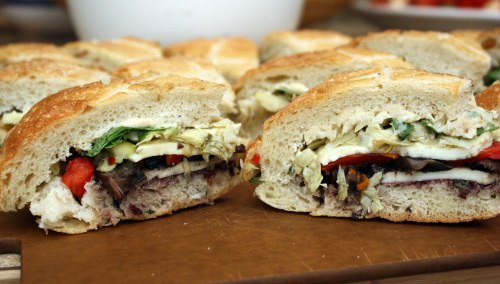 Put the cabbage down as the top-most layer of the sandwich and cover with the bread top. Wrap well in plastic and let side in the refrigerator overnight. Cut into 4 or 8 slices and serve with lots of napkins. I don’t really eat lunch. I work 10 hour days, so I eat healthy snacks throughout the day to keep my metabolism and energy up. I usually bring veggies, yogurt, whole grain crackers, and a couple pieces of fruit to eat during the day. 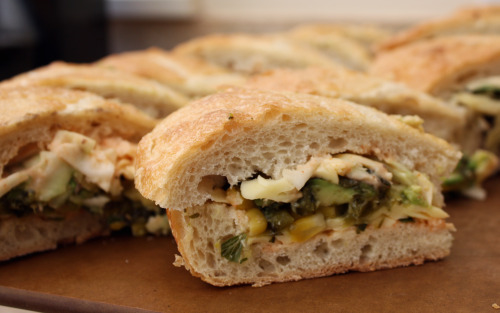 I might have to splurge one day and make this sandwich…or at least make it for dinner. It looks like a winner. Glad you had fun-a yoga retreat sounds heavenly, especially with a good friend. That is my kind of sandwich. Sounds like you did a fantastic job catering this event. I love hearty sandwiches…actually I have an unnatural obsession with most sandwiches, but I’m just weird like that. I love how creative both of these are, but especially the corn salad one! Tomatillo/poblano/corn salsa with AVOCADO and CHEESE. Mmmm delicious. You guys were seriously fueled for yoga! I’m the same with lunch, it’s just not something I know how to cook. In our family we never really ate lunch on the weekends, it was kind of every man for himself, so now if Ed asks me what we can have for lunch I never have a response. But sandwiches is usually what we end up having! I wish I could get into yoga, I know it is so good for toning….but I can get into a pan bagnat. I weigh mine down with cans and bricks for 2 days in the fridge. The spread looks fantastic, but I would expect nothing less. All your food looks incredible, and the sandwiches look divine! I can’t wait to try the recipe. Thanks!! I am not sure anything in this world sounds better to me than a corn salad sandwich. You say you’re not a sandwich lover? You’re a genius! was also at the retreat — I’m still flying — it was just a magical day. Everything was just delicious and I’ve been especially craving this sandwich. Thanks for sharing the day and this recipe! I looooove sandwiches! Friday is “Sandwich Day” at our office cafe, and I love it. 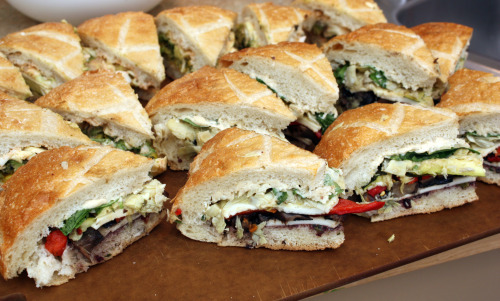 Your sandwiches look fantastic–it’s not often that I see delicious and unusual vegetarian sandwiches. well aren’t you a little cutie! i need to do more yoga, just haven’t the patience for it. it’s gross how many of those sammies i could eat. hey, what did you decide on the tat? Awesome sandwich! This one sounds absolutely fantastic. Corn salsa is always yummy and looks especially good here. Even without the grilled, this is one great cheese sandwich! Yum! I am all about the sandwich. One food I would want on a deserted island…sandwich. I attendend this heavenly day, all dishes were finger licking wonderful, but my fav of the two was the portabello sandwich. Better than a burger and this coming from the grand-daughter of a German sausage maker. You do amazing work Dana. Those sandwiches sound delightful! And I am not much of a sandwich eater. Even more exciting, I am amassing tomatillo recipes because I have a tiny little plant growing in my container garden that I am quite excited about. Gorgeous photos and gorgeous food! Your sandwiches look so good! I bet those yoga women love to have you feeding them. And don’t worry about the bread getting soggy–pan bagnat means “wet bread,” it’s supposed to be like that. My biggest complaint about Cafe Campagne is that their pan bagnet is too dry! Yum this sandwich sounds so good! I never come up with anything too creative when I make sandwiches.